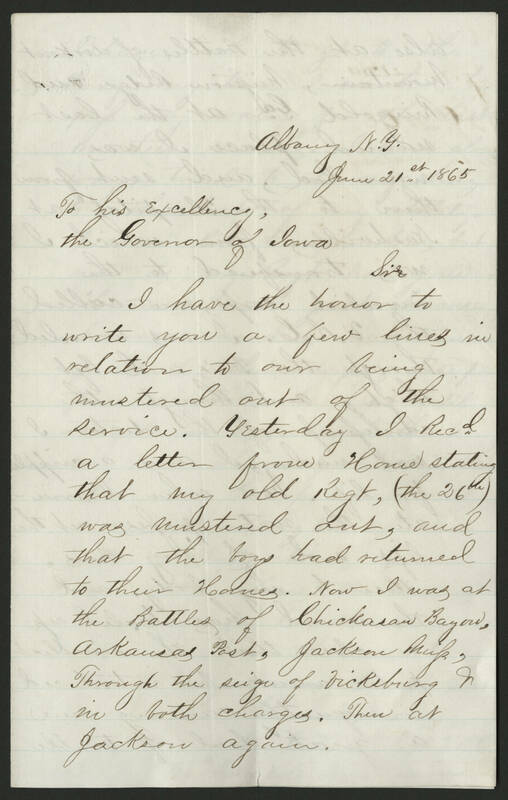 Albany N.Y. June 21st 1865 To his Excellency, the Govenor of Iowa Sir I have the honor to write you a few lines in relation to our being mustered out of the service. Yesterday I recd a letter from Home stating that my old Regt, (the 26th) was mustered out, and that the boys had returned to their Homes. Now I was at the Battles of Chickasaw Bayou, Arkansas Post, Jackson Miss, Through the seige of Vicksburg & in both charges. Then at Jackson again.